This banner is vertical with red at the back and white in front. The red portion has a "Katar" (Dagger) and "Khanda" (Big double edged sword) in yellow and white portion has Shri Hanumanji in red. 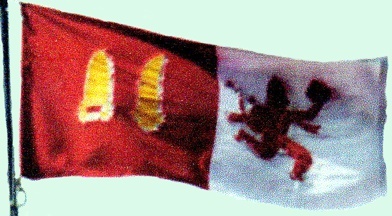 This standard flag flew only on the Palace of the Ruler. The red and green flag with State emblem (horizontal flag with dark red on the top and dark green below) flew on Royal family cars, State buildings, police, army and other official functions. A "Katar" & a "Khanda" they can be seen on the red State Flag, the "Khandia" is in the fly. The Katar was also the symbol of the former Indian state of Alwar. It was certainly depicted on their stamps (e.g., http://www.tibetanpost.com/images/items/A/alw0025.jpg).